Chief creative officer Mark Crumpacker speaks candidly about coming back from both the company food-safety crisis and his personal one. That’s Mark Crumpacker, the chief creative officer and marketing lead at Chipotle, upon returning to the restaurant chain after a three-month leave of absence. Following a cluster of food-safety incidents Chipotle experienced in the last 14 months, which devastated the company’s business and is the subject of our new Fast Company feature, Crumpacker was indicted for cocaine possession, on June 30. It was a bizarre aside to an already tumultuous time for Chipotle, though many observers saw it as yet another interruption in Chipotle’s protracted recovery. On September 8, the company surprised some outsiders by announcing Crumpacker’s reinstatement, after he completed a drug rehabilitation program. “I’m really lucky,” Crumpacker tells me just two weeks later. Since returning, Crumpacker’s team has launched a new ad campaign, in partnership with Austin-based agency GSD&M, highlighting the “royal treatment” Chipotle gives its ingredients. The company has also completed its nationwide rollout of its newest menu item, chorizo, which Crumpacker says was on the product roadmap before the chain’s E. coli issues. “We were like wait a minute, we can’t introduce something new before we got all of the food-safety measures in place,” he says. Before Crumpacker’s indictment occurred, these kinds of insights were why I had been eager to speak with him for our profile of Chipotle and its efforts to rebuild itself in the aftermath of a series of foodborne-illness outbreaks. Crumpacker, after all, was central in helping the Mexican fast-casual chain foster a glossy aura around its brand, which became synonymous with fresh ingredients and an ethical value set. Given the damage the food-safety crisis did to the company’s reputation, I knew Crumpacker would prove crucial in trying to repair Chipotle’s “Food With Integrity” image. 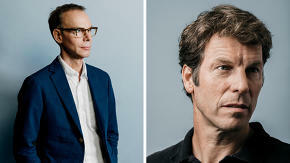 What’s more, he had known Chipotle’s co-CEOs Steve Ells and Monty Moran since college—all three attended the University of Colorado at Boulder and grew up not far from their alma mater—and could offer deep insight into their strategy going forward. A naive part of me wondered whether Crumpacker would still make our meeting that coming Thursday. But on July 1, a representative of Burson-Marsteller, the crisis-management PR firm that has supported Chipotle since the outbreaks, told me via phone that our meeting would be indefinitely postponed. My previously scheduled meeting with Ells the following week, however, was still on. When I arrived then at the company’s New York corporate outpost, also near Union Square, I found the lights off in Crumpacker’s office, which is adjacent to Ells’s. Rows of advertising awards lined his shelves, from the slew of successful marketing campaigns he produced for Chipotle in the past decade. They now sat neglected, lacking their glisten in the darkness, like the preserved childhood bedroom of a high-school track star who no longer lives with his parents. He tells me it’s been a painful period and speaks regretfully of how it unfolded in the media. “Obviously having something so incredibly personal made so public is not something anybody would want, but I’m a particularly quiet, private person,” he says. What mattered most to him during this time was the support of his friends and colleagues, most notably Ells and Moran, whose loyalty didn’t fade, he adds. Crumpacker is due in court October 18.